Katy Perry’s engagement ring might be the symbol of a relationship that fizzled out after just 14 months of marriage, but it’s a very popular one, nevertheless. She has been seen sporting different diamond rings in the past few months including one rumored to have come from John Mayer, but the two broke up without an engagement, so it’s time to revisit Katy’s original bling – a celebrity engagement ring that’s definitely worth talking about. Unveiled in 2010, this particular piece of Hollywood jewelry is simpler than some other celebrity engagement rings we’ve showcased; it features a stunning brilliant-cut diamond set in yellow gold. 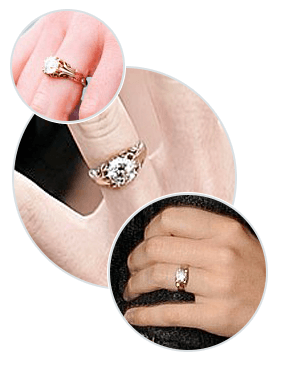 Like many of the styles Katy rocks onstage, the ring is vintage-inspired. Russell Brand successfully popped the question on New Year’s Eve while the couple were enjoying a candle-lit dinner in India, where they eventually married on a tiger sanctuary. Like Katy Perry’s engagement ring, this gorgeous sparkler from Brilliance is set in gleaming yellow gold and features beautiful vintage touches that showcase the brilliant-cut diamond perfectly. This is the perfect choice for anyone who loves Katy Perry’s flair for anything and everything vintage, and its’ price tag is much lower than you might expect it to be. Born October 25 of 1984, Katy Perry lived a sheltered life as a child; she had limited exposure to popular music and was on track to become a gospel singer as a teen, even releasing a studio album titled Katy Hudson in 2001. In 2002, she left home for Hollywood, where she soon recorded a collaborative album with The Matrix; it was not released until 2009, well after she had signed her 2007 deal with Capitol Records. Since achieving stardom, Katy Perry has topped one chart after another. Forbes has listed her as one of the top earning women in music three times, and she is also one of the best-selling artists of all time. Despite her musical success, Katy’s career isn’t just about music. She voiced the character Smurfette in the 2011 movie The Smurfs, and she released a documentary titled Katy Perry: Part of Me that same year. The movie not only concentrated on her artistic life, it also provided insight into the dissolution of her short marriage to Russell Brand. Did you know that Katy Perry completed her GED at age 15, and was allowed to leave high school in pursuit of her musical career? She studied Italian opera at Santa Barbara’s Music Academy of the West before releasing her gospel album. She was only 17 when she moved to Los Angeles, where she had a number of minor successes prior to her 2007 breakthrough with Capitol Records. What Our Experts Have to Say about Katy Perry’s Engagement Ring. Katy Perry’s engagement ring was once a 5-carat pink diamond one from Cartier, but she didn’t enjoy wearing it and swapped it instead for a simpler design, also from Cartier. The 3-carat center diamond is a perfect brilliant cut, and the gold setting looks magnificent on Katy. While the setting does feature some embellishment, the solitaire is the only diamond in the ring, making for a look that’s both classic and eye-catching. It has been reported that the ring was purchased for about $120,000 USD. Celebrity engagement rings like the one Katy Perry received from Russell Brand usually come with jaw-dropping price tags. If you’d like to celebrate your love in star style while saving money for the new life you’ll soon share, consider a beautiful diamond engagement ring from Brilliance, where conflict-free diamonds are the standard, and where our team of experts can help you design a custom engagement ring that suits your personal style while giving a nod to Katy Perry’s engagement ring – or to any other celebrity engagement ring, for that matter! Whether you select one of the hundreds of existing styles or create something special to celebrate the unique love you share, you’ll be thrilled with the beauty and glamour your engagement ring brings into your life.